My friend Blair helped me see that there’s a big step squarely in front of me: Daring to follow my dream. I see a possibility for something I can create. I get excited about it, I’m energized when I lean into it, when I can engage others around it, when I see it taking even the smallest of shapes. Because I can’t articulate my vision clearly and completely, sometimes I feel like I am speaking a language that others don’t understand. This past week I felt like I was all alone in a big room and when I tried to get out, I just bumped into walls and couldn’t seem to find my way through. In there I was filled with self-doubt, uncertainty, and, fear. So much of what I tried left me tender and bruised. It was those moments when I let myself just feel what I felt, instead of trying so hard to make it go away, that the catharsis happened. I cried – alone, with my husband, with my girlfriends, even with a co-worker. I noticed how the Vicki who wants to be perfect questioned whether I should have let my emotions hang out with a colleague. I was bumping up against a wall again, judging, attached to something different than what was. Over lunch with several of my girlfriends, one of them said to me “Your vulnerability is your strength.” I had to sit with that awhile. This emotional response a gift? Yes, it’s my heart showing. How can that be a bad thing? That soft spot is what enables me to connect with people, to empathize, to care, to give. That truth deep inside of me is what enables me to get passionate about something, to engage, to create. So it was there at the lunch table with Lati, Idil and Demet that I realized life is inviting me to be vulnerable. This feels like one of those peak moments in life, where I must choose: Am I going to lean into what’s true for me, or turn away from it and let others’ energy and ideas direct my course? I’ve had peak moments in my life where being vulnerable was the only way to the other side: Moving to a new town. Losing my grandparents. Leaving the safety of my parents. Falling in love. Taking my first job. Getting married. Putting my dog to sleep. Getting unstuck in my career. Running a marathon. Surviving cancer. Ah, now that last one was a big step in discovering what’s possible when I let my true self show up, in all her imperfection and beauty. I thought I had learned all there was to learn about being wide open. Ha! No coincidences that awhile back one of my dear friends sent me Brene Brown’s book Daring Greatly. I devoured the pages – when I picked it up the other day I found it filled with underlined phrases and notes in the margins. Even so, I don’t think the power of Dr. Brown’s wisdom truly sunk in until now. I see the truth that being a great leader requires one to be vulnerable. What does being vulnerable mean to me? 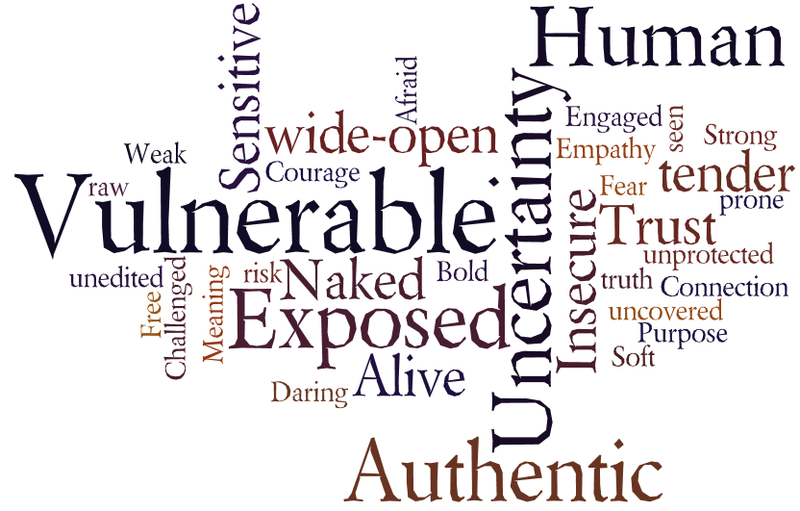 What does vulnerability look like for me? When do I find myself feeling vulnerable? How do I feel when I am vulnerable? How do I react when I find myself vulnerable? How willing am I to be vulnerable? Vulnerability is an “and”. It is being weak; it is being strong. It is being afraid; it is being courageous. It is cowering away; it is daring greatly. It is soft; it is bold. Being vulnerable is like being naked – exposed, wide-open for all to see. It can be somewhat terrifying, with feelings of overwhelm, anxiety, fear. Being vulnerable is like free-falling, letting oneself go, feeling out of control, uncertain of the landing. Being vulnerable makes me feel like a raw emotional nerve – touch me and I might break. I feel vulnerable when things are uncertain, when I face challenges, when I am not sure that I have what it takes or am the right person or good enough. When I don’t allow myself to be vulnerable, I try to control things, I manage people, organize things, think my way through, cut off my emotions, and shut down the very things that make me feel alive. Vulnerability might look like standing up for myself, asking for help, trying something new, falling in love with something, sharing an unpopular opinion, admitting fear, asking forgiveness, having faith in something, being accountable. I envision vulnerability is like going out on a limb, like being up very high on a very skinny branch, hanging out there. And, here’s the delicious catch in all this: Vulnerability also makes me feel alive. When I really open myself up, it’s liberating, exhilarating. It feels right. I’m filled with hope, a sense of possibility. From a place of vulnerability, I connect with people, I am able to empathize, be there for others. I form bonds; I trust. I feel strong, courageous, engaged with life. I feel free. From this place, I am able to see most clearly who I am, what I want, what’s important to me. I find purpose and meaning in my life. Brene says vulnerability is the birthplace of love, belonging, joy, courage, empathy, and creativity. It is the source of hope, empathy, accountability, and authenticity. If we want greater clarity in our purpose…vulnerability is our path. Yes. 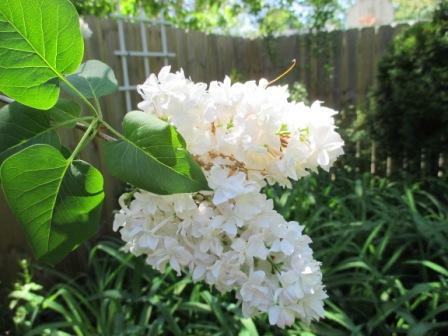 * I took the photo of these lilacs in my backyard on a spring day in 2013. The word that I connect with this kind of vulnerability is: humility. For me, really key for a leader that people dare to follow…. Thank you, Thorsten. I agree with you that vulnerability is key to trust, and that so much is possible when there’s trust. Appreciate your sharing. Happy spring! Lorian, glad you found it useful! Gotta love Brene Brown! I sense Your strength only growing stronger by the day – i am sure You will ‘keep calm’, and remain true to Your deepest convictions. Soar high! Glad you came over and enjoyed it, Kristin!